One of my favorite seasons of the year is finally upon us! Truthfully I love every season, but I tend to get most excited for summer and fall. Here in Austin it still feels like summer (with temps in the 80’s), but that doesn’t mean we can’t start adding fall staples to our wardrobes! 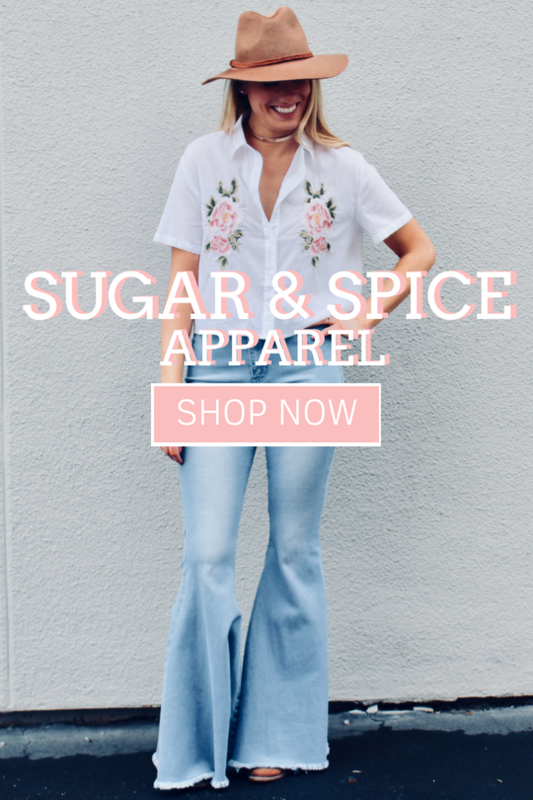 I just launched the first round of our fall 2018 collection for my boutique, Sugar & Spice Apparel, so I figured I would share some of my favorite pieces! I’ve included photos and details of how to style each item. All clothing (unless otherwise stated) can be found on my boutique’s website, sugarandspiceapparel.com. Jean skirts are so versatile and I’m so happy they’re back in style. This distressed denim skirt is one of my all-time faves. I knew immediately when they arrived for my boutique that I needed to keep one for myself – there are so many ways to style this skirt and endless tops to pair it with. The photo above is just a simple tee (random find from TJ Maxx for only $10!) that I tied into a knot for a makeshift crop top. Other cute looks include tucking a tee in, pairing with a cropped sweater, or throwing on a bodysuit. Keep scrolling to see this skirt paired with more tops from Sugar & Spice Apparel! The comfy chic tee is one of my ultimate go-to staples, especially now that I’m self-employed. I am often running errands during the day and definitely don’t want to dress up, but also don’t want to look like a total mess. These tees are life-savers and can make you look put together even though you’re just wearing a t-shirt! This particular tee comes in three different colors – sage (pictured above), burgundy and peach. The cropped sweater is another one of my go-to fall staples because you can stay warm and comfy, but still look stylish. High-waisted jeans, skirts and leggings are pretty much all I wear during the winter and fall, so cropped sweaters are the perfect top for pairing. This sweater is simple yet chic, so its versatility is something I love! So easy to dress up or down. More cropped sweaters and this denim skirt can also be found on my boutique’s website. I’m obsessed with jumpsuits of any kind, but these bell bottom jumpsuits are super unique. The mustard jumpsuit pictured above was actually part of my boutique’s summer collection, but has been my best-selling jumpsuit ever (only one left – size small)! Since it was such a customer-fave, I thought I would include a similar jumpsuit for fall (forest green jumpsuit pictured above). These jumpsuits still show off your figure with their smocked bodice and can be worn in a variety of situations just by pairing different shoes with them. When I was in Europe I paired the mustard jumpsuit with sneakers for touring different cities, but I have also paired these jumpsuits with wedges when I want to dress them up. Western fashion is such a current trend and I’m totally on board. This button-down top is a twist on a classic western shirt, with modern feminine details of a fitted elastic waist and adjustable tie. Absolutely love this top and it can be paired with almost any style jeans – skinny, distressed, boot cut, bell bottom – you name it. This top is styled in the photo above with the Hit Me With Your Best Shot bells from Sugar & Spice Apparel. I am completely obsessed with fringe and have been wearing fringe for several years – before it fully came back in style. I remember when I wore a romper with fringe sleeves in 2015 and definitely got some weird looks, but I love pushing fashion boundaries and wearing what I think is stylish, no matter whether or not it’s a current trend! This fringe sweater is a cropped style, but not as short as most crop tops. I love how the fringe detail turns a basic sweater into something much more unique. It’s paired with the distressed skirt from earlier in this post. These are just a few of my favorites from the first set of the fall 2018 collection from Sugar & Spice Apparel! Many more are currently up on the website, and you can find all of the new fall arrivals here. More are coming soon, including a cheetah print skirt, black and dark wash denim bell bottoms (our spring/summer light wash went super quick! ), colored corduroys and many more sweaters. Stay tuned for our next additions to the fall 2018 collection, which should come at the end of October/beginning of November! We Bought Our First House!